This circuit corrects the problem somewhat and allows a larger voltage swing and probably more output power, but I don't know how much without doing a lot of testing. Here is a little audio amplifier similar to what you might find in a small transistor radio. The input stage is biased so that the supply voltage is divided equally across the two complimentary output transistors which are slightly biased in conduction by the diodes between the bases. The 60 Watt linear amplifier is simple all solid state circuit using power mosfet IRF840. Useful for amplifying weak signals before amplifier. It is designed for portable cassette players and radios. You can also use it as your PC Audio Amplifier. A few external components required to build this circuit. This complete high quality, low noise 5-BAND GRAPHIC EQUALIZER circuit is based around Monolithic Linear integrated circuit LA3600 manufactured by SANYO. This circuit is very easy to build and has good Quality. Infrared cordless Headphone Amplifier circuit diagram. 20W Audio Amplifier kit is based on LM1875 IC. Small audio amplifier for weak signals. Simple to build. Amplifier for your computer. Very serious electronic project. The LM1036 is a DC controlled tone (bass/treble), volume and balance circuit for stereo applications in car radio, TV and audio systems. An additional control input allows loudness compensation to be simply effected. Tendency of catering: 15V Force of expense: 4,2Wrms in the 4W Minimal signal of entry: 94mVp-p with preamplifier, 0,65Vp-p without the preamplifier. This 3 channel 15 LED spectrum analyzer is the perfect addition to any audio amp project. It produces fantastic displays on three LED bars that can be individually adjusted for any particular frequency range. The circuit is simple, yet is capable of excellent performance. I designed it specifically for use as an amplifier for the digital sound card in my computer. 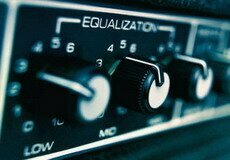 Audio input can be from any two-channel line level device such as a television, CD player, or VCR. The aim of this design is to reproduce a Combo amplifier of the type very common in the sixties and the seventies of the past century. This circuit is intended to indicate the power output level of any audio amplifier. It is simple, portable, and displays three power levels that can be set to any desired value. Audio amplifier that boosts bass tones. This preamplifier was designed to cope with CD players, tuners, tape recorders etc., providing a gain of 4, in order to drive less sensitive power amplifiers. As modern Hi-Fi home equipment is frequently fitted with small loudspeaker cabinets, the bass frequency range is rather sacrificed. This circuit, connected with 32 Ohms impedance mini-earphones, can detect very remote sounds. Useful for theatre, cinema and lecture goers: every word will be clearly heard. In recent years, following CD's introduction, vinyl recordings are almost disappeared. Nevertheless, a phono preamplifier is still useful for listening old vinyl discs from a well preserved collection. Precision Audio Millivoltmeter. Uses audio for measuring voltage. 10W Mini Audio Amplifier with very small count of electronic components based around TDA2003 circuit. You can use this powerful amplifier in any small audio project. It is very small (6.5 x 4.5 cm). It outputs 10W and uses a 9V battery. 18W Audio Amplifier made of transistors. Two low voltage, low power zeners are used to control electronically the level of an audio signal. The attenuation range is from 6 to 58dB for an input current from 0.042 to 77 mA corresponding to a control voltage from 2.7 to 7.5V. The circuit is a microphone amplifier for use with low impedance (~200 ohm) microphones. This is a handy, easy to build general purpose 50 watt amp. The amp has an input for a radio, TV, stereo or other line level device. High Quality simple unit. No need for a preamplifier. Audio wireless transmitter and receiver. It uses laser beam from laser pointer to transmit audio signal. Not so applicable, but very interesting and easy circuit to build. The controls may also be adjusted for use as a band stop (notch) filter or band pass filter. A simple mixer with 3 line inputs and 3 mic inputs using commonly available parts. The mic inputs are amplified about 100 times or by 40dB, the total gain with the mixer is 46dB. Audio preamplifier designed for dynamic or electret microphones. Uses several components which are easy to find. It has a 23.5k ohm input impedance. It can be used to amplify weak signals other than from microphone. A 15 watt amplifier made using discrete components. Interesting and not so difficult do build. Mini-box 2W Amplifier Designed for self-powered 8, 4 & 2 Ohm loudspeakers. Contains Bass-boost switch.